Just a quick photo entry. Not too many words. Tawn and I joined a small group of friends at Soul Food Mahanakorn for dinner to celebrate my birthday. The food (Thai) was very good as usual and other than the oddity of being served sparkling wine in regular wine glasses (which the owner caught and corrected), everything was very enjoyable. It rained heavily during dinner, the first rain in a few weeks. Afterwards, the evening air was cool and relaxing. From the left: Doug, Tae, Tawn, Tod, Matt, Suchai, Ken, and me. We are missing Doug’s girlfriend Bee, who arrived late from work. Suchai and Ken goof around for the camera. The T-Team: Tae, Tawn, and Tod. 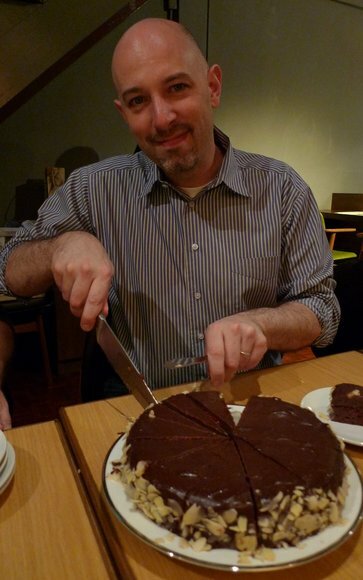 Slicing my own birthday cake. How come I’m doing all the work? Chocolate raspberry torte. Made it myself and will write more about it tomorrow. Stay tuned. This entry was posted in Uncategorized and tagged Bangkok, Birthday, friends, Soul Food Mahanakorn by christao408. Bookmark the permalink. oh wow – what a wonderful cake. I bet it tasted fantastic. Good friends and good food! That’s the way to celebrate! that cake looks great! happy belated birthday! my bf just turned 40 this year too, and he loves chocolate and raspberries hahaha. great coincidence. Nice chocolate cake and good company! Can’t wait to take a peek at the recipe! @kunhuo42 – @puella_sapiens216 – Chocolate and raspberry is just one of those really good flavor combinations. You would think that cacao plants and raspberry bushes would grow next to each other in the jungles. Unfortunately, that is not the case…@TheCheshireGrins – @yang1815 – @Fatcat723 – It was a very fun celebration. 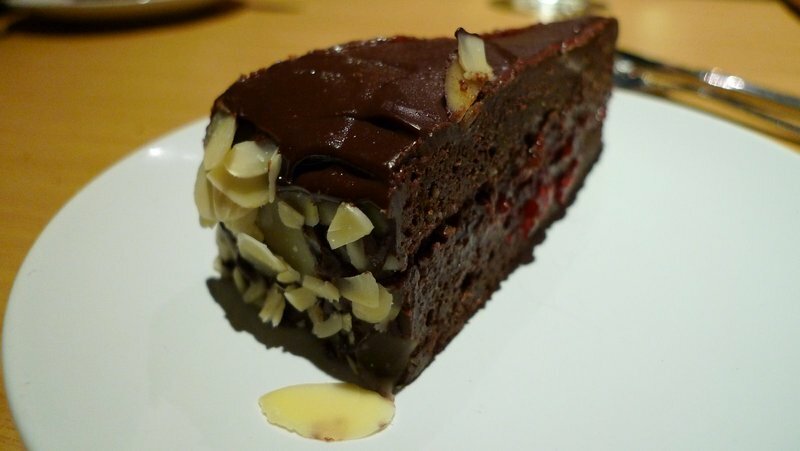 @agmhkg – @venice – @stevew918 – The cake was tasty but I have to say that I’m generally not a cake person and these flourless cakes are really dense. Will write a bit more about it tomorrow. Aw, you are still just a kid! Looks like you had a good party. Belated Happy Birthday!!! Looks like you had a good time. Have a great 41st year!! I agree that the cake looks awesome but the friends look even better! Glad you had a happy birthday! Where are the pictures of the food? I think you’re a bit biased towards your cake. It’s great that you were able to celebrate with friends. Happy Birthday!!! =) You look really good for 40!! Happy Birthday! I wouldn’t put you a day over 35! Such a great milestone with such wonderful friends. Congrtulations on this birthday Chris. From here? It totally looks like you have a perfect life! And you put a lot into it too! I’m glad you had a good birthday… very pretty cake!